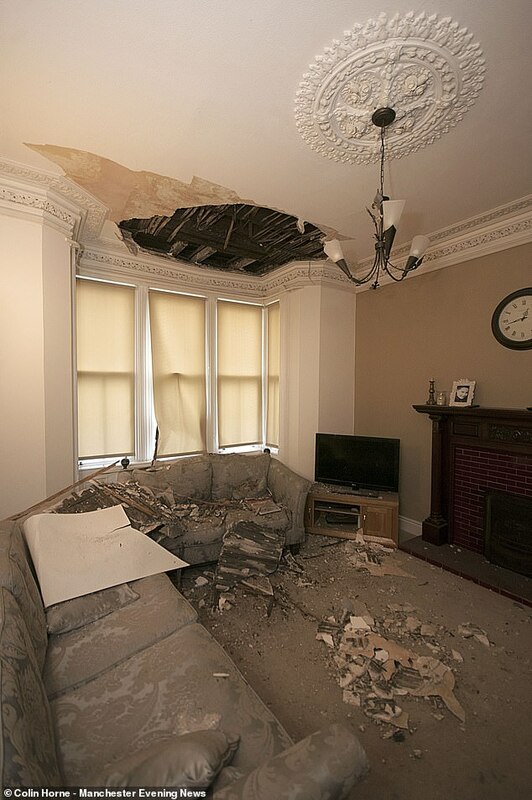 A mother has spoken about the moment her living room ceiling collapsed as she watched the television with her two-year-old twins. 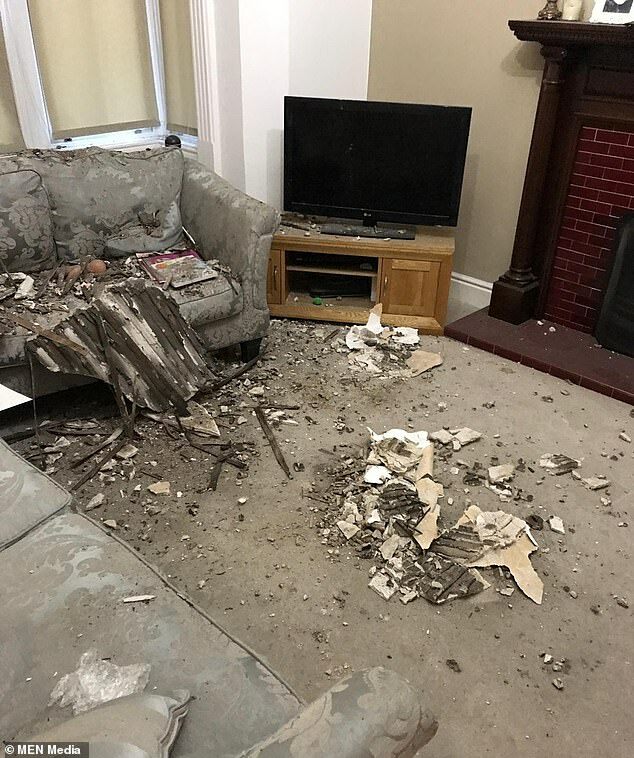 Sarah Hayhurst, 39, from Tameside, Manchester, narrowly escaped pieces of plaster and wood as it came crashing down on the settee she had been sitting on seconds earlier with her toddlers Clara-May and Harry. 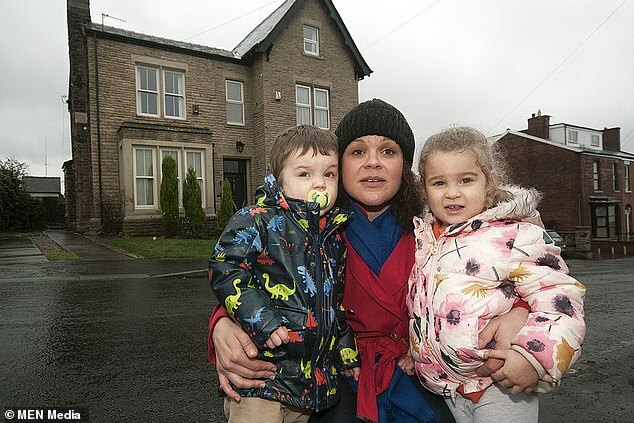 Following the collapse, Mrs Hayhurst, the twins, father Simon, 40, and 11-year-old Molly, have been living in a hotel as they do not feel safe in their 200-year-old Victorian villa. Mrs Hayhurst said: ‘I was watching TV at about 8am with the twins when I heard something drop. 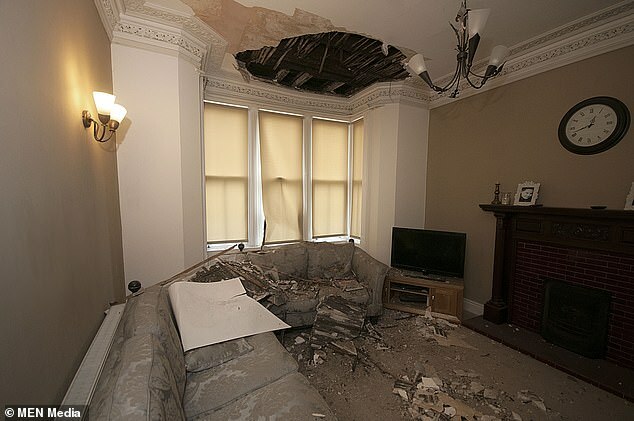 I looked and it was some plaster from the coving. ‘I thought ‘I don’t like the look of that’. ‘I grabbed the kids’ hands and as soon as I did so I heard an almighty crash and the ceiling came down. The family moved into the house last July after moving from Surrey to be closer to family, paying the £12,000 year’s rent up front. Mrs Hayhurst says she has been told by a structural engineer she asked to look at the house that a supporting beam above the bay window is cracked. And until repairs are carried out the family are refusing to move back in. She added: ‘We are not prepared to stay there with three children until a qualified structural engineer says it is safe. ‘Weeks on we are not further on and no wiser as to when we can go back. ‘Our 11-year-old is breaking into tears every five seconds. The twins are not sleeping properly and keep asking, literally every time we walk into a room, if the ceiling is going to fall down. ‘And me and my husband are feeling the strain. Hannah Davies, Lettings Director of Reeds Rains letting agents said: ‘The safety and security of tenants is of utmost importance to us and, as a result, we have worked hard with the landlord to find temporary accommodation for the tenant and continue to seek urgent approval from the insurance company for the building works to proceed. 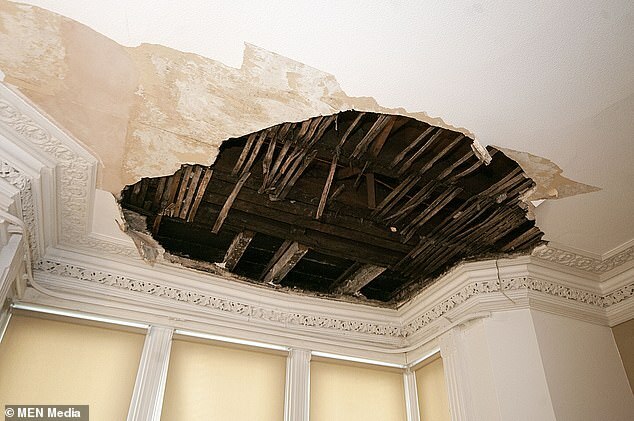 ‘We have comprehensive evidence of our continued and urgent attempts to gain the support of the insurance company in resolving this matter (including the appointment of a structural engineer) and regrettably until this is gained we are unable to proceed in organising any remedial work. ‘In the meantime, in terms of alternative accommodation, despite an independent report from the Tameside Council Housing Standards Officer – which stated ‘that it was not considered necessary for the family to be re-housed and that the landlord should not act or refund any money to the tenants’ – Mrs Hayhurst has organised her own hotel accommodation. ‘We have subsequently – and repeatedly – attempted to gain the invoices for this from Mrs Hayhurst but refusal to provide these invoices is also impacting the resolution of this case.